Up there with Mount Royal and Parc Jean-Drapeau as one of Montreal's most popular parks, Parc La Fontaine is tiny in comparison, its modest 34 hectares (84 acres) of green space containing two artificial ponds linked by waterfalls, located in the heart of the Plateau neighborhood. Not that size matters. La Fontaine's charm trumps with its top ice skating destination in the winter and its claim to fame as a favorite local hangout come summer. It's also a choice spot for performance art, from music to theatre, courtesy of the park's Théâtre de Verdure, in close proximity to Montreal's best poutine. 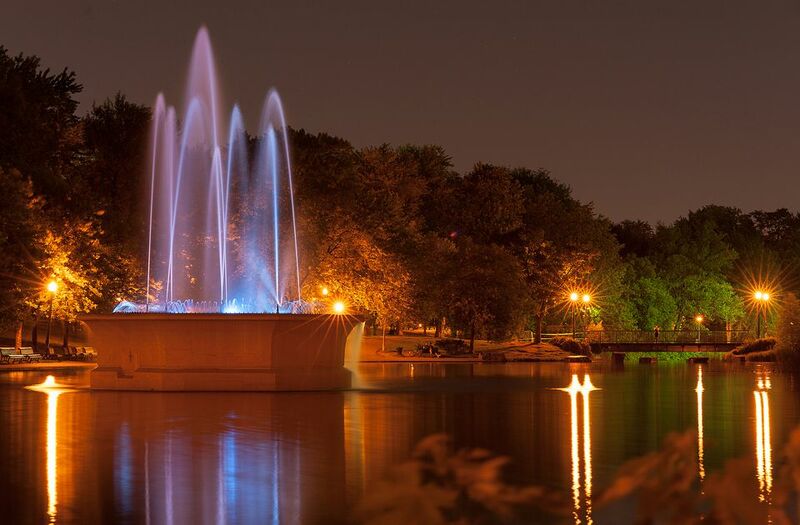 A popular picnic destination courtesy of its water features and undulating green space, Parc La Fontaine attracts cyclists, pedestrians, and the local Plateau neighborhood community to linger on its grounds and the park's café/bistro terrace. Free summer tango dance lessons are a recurring summer theme, as are theatrical performances, live music, film screenings, and dance recitals in the park's Théâtre de Verdure. Parc La Fontaine's skating rinks are among the city's most beautiful. Ice skate rentals as well as and indoor changing area, food services, and bathrooms are conveniently located near the rinks and ice paths. From featuring a little people's "palace" for roughly 60 years to hosting a small zoo for the better part of three decades, there was a time in the '80s when today's family-friendly park was the site of a gang and male prostitution problem. But a lot can change in a generation. Or three. As for little people's palace, "The Midget's Palace" was the 1926 creation of Count and Countess Nicol—real names Philippe Adélard Nicole and Rose Sémilida Dufresne—a three-story house custom-made for people under four feet tall with low ceilings and miniature furniture located at 961 Rachel Est, an attraction reminiscent of PT Barnum's sideshow circus days which persisted in Montreal well into the late '80s under different ownerships, including under the care of three-foot-nine curator Huguette Rioux, who purchased the building in 1972. Returning to Count Nicol, he originally hoped to build the house in the middle of Parc La Fontaine. But he couldn't secure a permit so Nicol did the next best thing. He set up his home beside the park, thirteen years after settling in Montreal and opening his first "Midget's Palace" storefront on 415 Rachel Est. Dubbing themselves "the world's smallest couple" and "the richest of all dwarfs," opening their home to the public was nothing short of a business success story for the couple. By the way, don't bother looking for the house today. It was since turned into a gay sauna which since 2012, also went the way of the dodo. And the zoo? "Le Jardin des Merveilles"—that's French for The Garden of Marvels—was opened in 1957. It was a remarkable success in the '60s, attracting droves of visitors to its urban stable of farm animals and foxes, bear cubs, swans, peacocks, seals, sea lions, a moose and even an elephant named Toutoune. But that popularity didn't stand the test of time. The zoo was dismantled in 1989.